With the start of the new year, many people reflect on the previous year and begin to plan out how they can make the next year better. Getting in shape and saving money are always the top goals on the list, but many times, we set unrealistic expectations that have us failing before February. I too am one of those people who fails at my exercise goals, but I’ve always been pretty good with money. I’m a natural planner, so budgeting my money came instinctively to me. No matter my income, I’ve always been able to support myself, while still enjoying life. For example, when I did two years of Public Allies, an AmeriCorp program after graduating from college, I did a great job managing my small income while still living a fulfilled life. It’s no secret that AmeriCorps members (in other words, paid volunteers) make about, if not less than, $15,000 a year. While in AmeriCorps, I managed to live on my own (with a roommate, but without the assistance of my parents), pay my bills on time, go on weekend trips with my friends to places like D.C., treat my (now) fiance to a Brooklyn Nets game as an anniversary gift, and buy all of my family awesome christmas gifts without going into debt. For me, it was a simple thing of making a plan and sticking to it. Most people know that’s all you need to do to budget, but it’s the actual making of a plan that stumps some people. Allow me to offer some of my tips. Understand your income vs. your expenses in detail. It’s impossible to budget without really knowing how much you spend vs how much you make. Most of us know how much our bills are and how much our income is, but we fail to include things that don’t have an actual bill attached to it in our budget. For example, if a person doesn’t have a washer and dryer in their home, they may have a laudry expense that they don’t include in their budget. It’s important to include everything you can think of that you spend money on in your expenses. Here’s a tool you can use to try to track all of your expenses in one place and compare it to the amount of money that you bring in: Blank Budget Sheet. Be sure to add categories if this tool doesn’t include all of the items/services you spend money on. If you find that your income doesn’t cover all of the thing you usually buy, play around with different ways to cut down on some of your costs. Can you decrease your cable bill? Can you cut back on dinning out? You want to be sure you have some extra money left over after all of your bills are accounted for. Pay your debt/bills first and play later. Once you know how much your expenses actually are, you’ll want to subtract them from your overall income first before you plan out your spending money. Your expense are things that you can’t or refuse to live without, like your rent, car insurance, grocery budget, etc. You need these things, so make sure you have enough money subtracted from your income to cover those things before you subtract money to cover things that you can live without, like new clothes. Sounds simple right, but many people try their best to work in reverse. Save for your goals second. If you’ve been dreaming about getting a new car, saving for a dream vacation, or maybe just saving for a rainy day, put a little money from what’s left after your expenses away for your goals. There is no set number or percentage of how much you should put away for your goals, but it should be a meaningful number to you that’s still realistic. It’s unrealistic to think that you will be able to save every penny of what’s left after your expense for your goals. You will fail if you take that approach. But you should set aside a meaningful amount that will still leave you with some spending money. 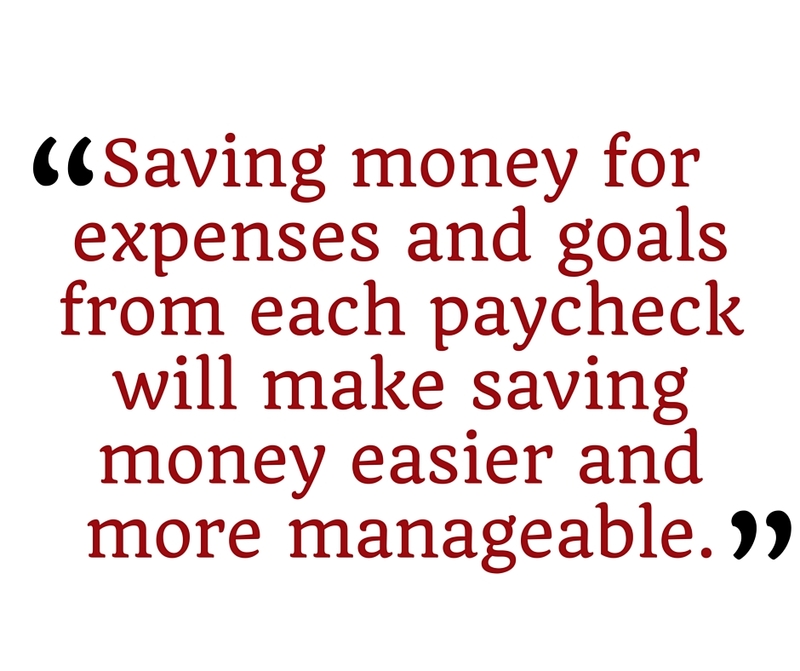 Save money for your expenses and goals from each paycheck. If you get paid twice a month/bi-weekly, each paycheck, set aside half of the money needed to cover your expenses and goals. If you get paid 4 times a month/weekly, set aside a quarter of the money needed to cover your expenses and goals from each paycheck. The number of checks you receive each month should reflect how much you are saving for your expenses and goals. Saving money for expenses and goals from each paycheck will make saving money easier and more manageable. *Bonus* The same method can be applied to spending money to avoid that “no money the day before pay day” problem. Divide left over spending money (after expenses and goals) by the number of weeks in between pay periods and only spend that amount of money each week. Think of saved money as not yours. It’s very tempting to take a couple of dollars out of money you’ve saved when you see the number start to add up. You start thinking about all the tings you could buy with the amount that you have right now and how much more money you need until you can get the thing you’re actually saving for. I get it, but don’t do it. Don’t even think about the money you’ve saved as yours. It doesn’t belong to you. That money belongs to your trip, or your car, or whatever you’re saving it for, just not you. 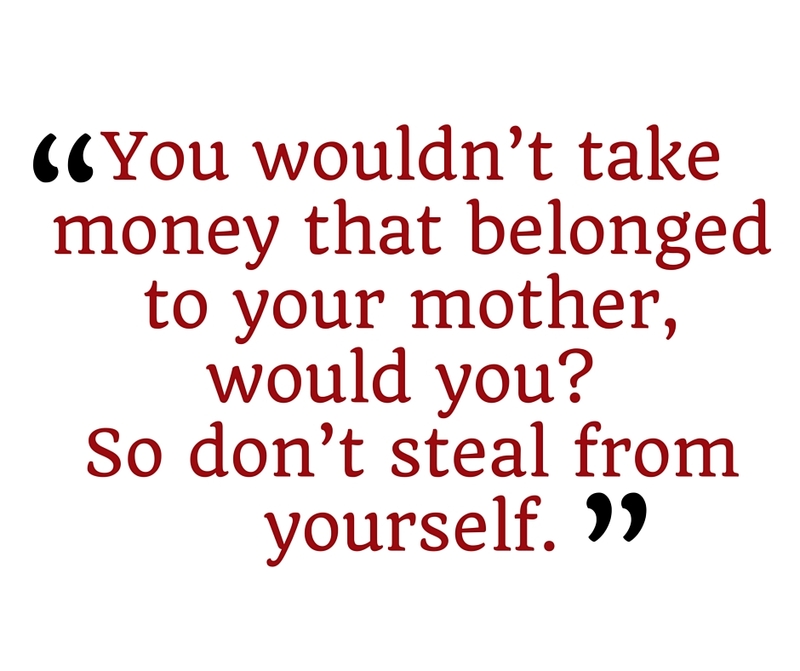 You wouldn’t take money that belonged to your mother, would you? So don’t steal from yourself. It’s not yours. It belongs to your goals or expenses. If there is an item that you really want, include that item in your goals and budget for that item as well. Get a separate account for your savings and your spending. It’s very easy to accidentally spend saved money if it’s sitting in the same pool as your spending money. You have to separate the two. In addition, when you save money in a separate account from your spending, you can rely a little on the “out of sight, out of mind” rule. If you’re not even seeing what’s in the savings, you won’t be tempted to spend it. Those 6 tips are the foundation to budgeting. If you follow those rules, you’ll be sure to get out of the living paycheck to paycheck rut. Understand your expenses vs your income, plan for your goals, budget how you will save money each paycheck, and don’t spend your saved money. If you can follow those rules, then you can budget. Do you have some budgeting tips that I missed? Leave them in the comments. Next in the lifestyle series, we’ll dive deeper into the topic of understanding expenses vs income with helpful tips and tools. Check back soon or be sure to hit to follow button so you never miss another post. Like what you’re seeing on Passion Me This? Sign up to follow this blog! It’s easy.